I’m lukewarm when it comes to plain potato chips. I warm up a little to flavored chips, though. My favorites usually involve a combination of the words “kettle” and “jalapeno.” But, these days, I tend to stay far away from traditional fried chips and opt for baked. And with that in mind, I tested a trio of flavored baked chips to see if the savings in fat and calories cost much in terms of flavor. Take a look. Let me know if you have your favorites as well. 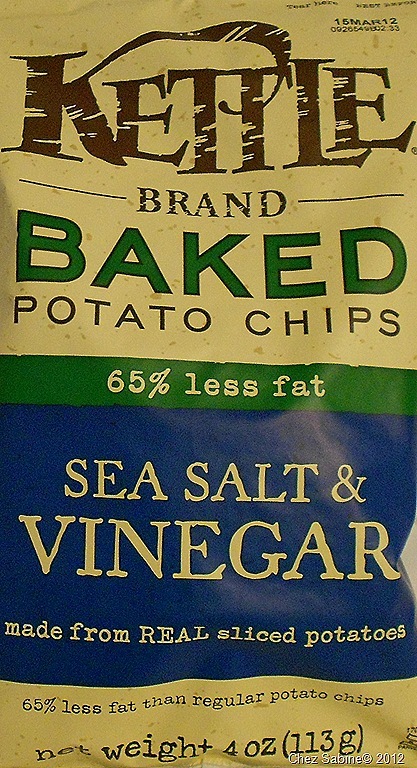 Kettle Brand baked potato chips, Sea Salt & Vinegar, $3.70 for 4 ounces at most supermarkets. First look: The package boasts that these chips have 65-percent less fat than regular potato chips and that they’re made from real sliced potatoes. Each serving — about 20 chips — contain 120 calories, 3 grams of fat, .05 gram of saturated fat, 2 grams of fiber and 210 milligrams of sodium. Note that all three brands have pretty much the same nutritional values. Ingredients include potatoes, safflower and/or sunflower oil, vinegar powder and sea salt. Good news: They look and taste like traditional, fried potato chips. Good crunch factor. Some of the chips even boast the peel. Very few broken chips in the bag. I really appreciate the simple (and few) ingredients. Bad news: A little wimpy on the vinegar. I like a really tart vinegar-and-salt chip, and this one didn’t really keep my attention. More expensive than the other two chips tested. Last words: Good texture but falls flat on pucker factor. 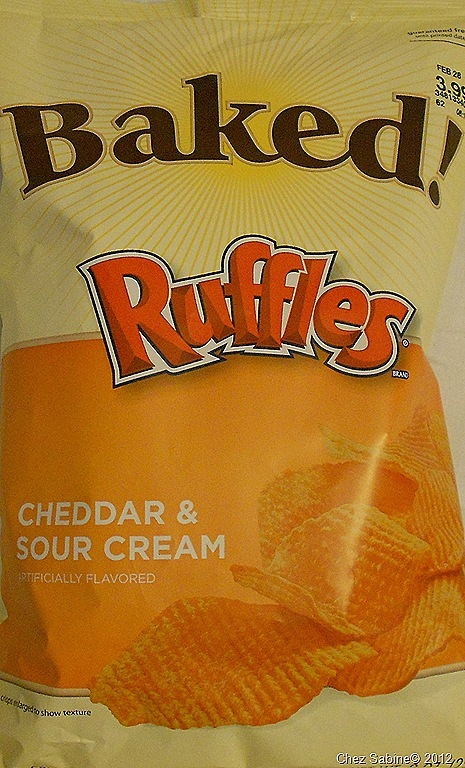 Baked Ruffles Frito-lay, Cheddar & Sour Cream, $3.99 for 9 ounces at most supermarkets. First look: Oh oh. These are billed as potato crisps, not chips. They offer 65-percent less fat than regular potato chips. Each 1-ounce serving contains 120 calories, 3.5 fat grams with .05 gram of saturated fat, 2 fiber grams and 270 milligrams of sodium. Ingredients include dehydrated potatoes, modified corn starch, corn oil, sugar, corn maltodextrin, salt, whey and Cheddar cheese. Good news: If you like a lot of action in your flavored chips, then these deliver. They provide that salty, cheesy combo that makes a lot of folks gravitate to flavored chips in the first place. Bad news: These crisps don’t provide the familiar texture and crunch as traditional chips. They look preformed. And I’m not thrilled with the ingredients that go way beyond potatoes. Last words: A crisp does not a chip make. 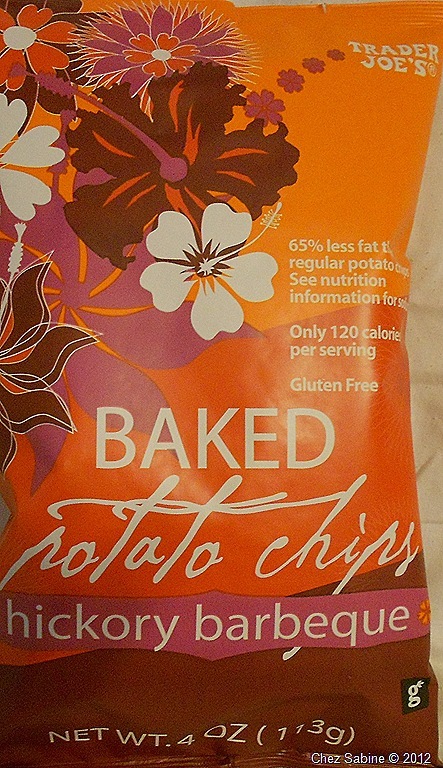 Trader Joe’s baked potato chips, Hickory Barbecue, $2.69 for 4 ounces at Trader Joe’s. First look: These, too, offer 65-percent less fat than regular chips. A 1-ounce serving contains 120 calories, 3 fat grams with .05 gram of saturated fat, 160 milligrams of sodium and 2 grams of fiber. Ingredients include potatoes, safflower and/or sunflower oil, honey powder, salt, spices and hickory smoke flavor. Good news: Each bite gives you a big burst of spicy sweet hickory flavor backed up by plenty of satisfying crunch. The trim list of ingredients won’t make you dizzy. Bad news: These are so good that you’ll probably want to eat the whole bag. That’s bad. Last words: Forget fried as long as Trader Joe’s baked chips are around.